Assuming it's not too cold, hot or windy, I'll be shooting for the following times. My swim hasn't improved much since last year due to injury and lack of a coach. I'm going to shoot for 2:15 based on increased experience. My bike has improved due to NOLA training so I'm shooting for 20.5 mph. This will be highly dependant on wind speed. My run hasn't improved much and this run will be twice as long as all the above times. I'll shoot for 8:45, but I should be able to run faster. 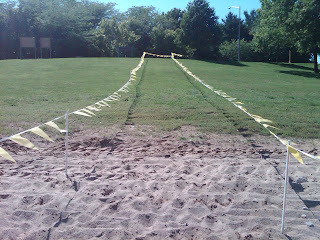 T1 includes a long uphill from the lake to the transition area. Truth be told, I'll be happy with anything under 3 hours and even more happy if I don't get stressed leading up to the race. Recipe of the week. My friend and co-worker Frank shared this recipe with me for beer brined chicken. It turned out great! I might do a bunch of legs and wings for a football game this fall, great flavor. 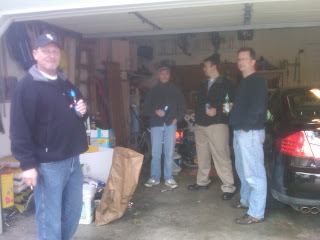 I forgot to take a picture of the chicken, but I did get a pick of the neighbor guys in the garage helping me cook. I grill rain or shine, heat wave or blizzard and I get lots of help. It's always nice to unwind with the neighbors. ﻿ Last but not least. My volume has been down the last couple weeks and my body is craving more volume. It's hard to describe, but it is the same kind of craving I get for fries if I stay away from them for a few weeks. So I'm close to signing up for another half ironman the first weekend in October. The one I'm looking at has a 63 mile bike leg instead of 56. I was ready to get off the bike about 40 miles in at NOLA. Looking at the calendar, that is 19 weeks out! How can October seem so close? 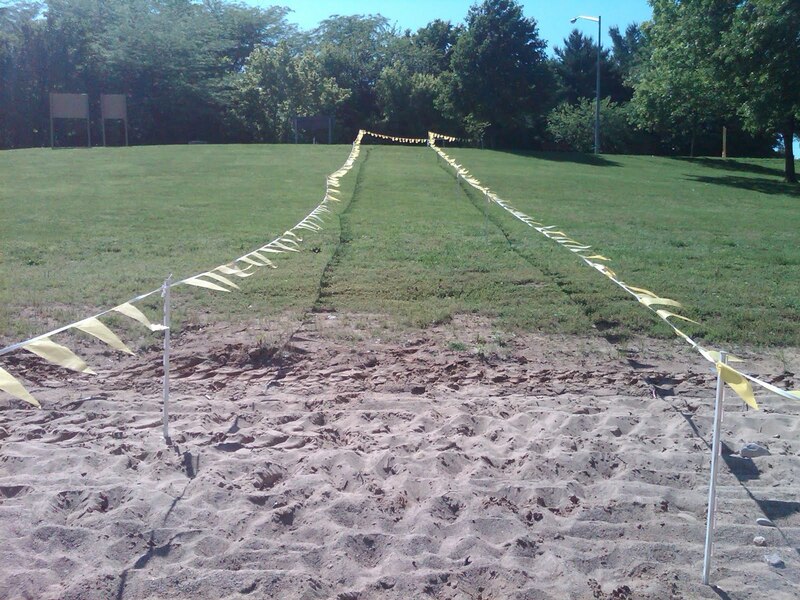 I am glad you posted the picture of the transition area at Carlyle, never having been down there it's tough to work through the race mentally. Just a week off!!!! Good luck to you MIke! I am thinking this summer is a good time to try my first tri. Right now, the only part of this that makes any sense to me regarding times/stats is the running part. :) But good luck to you. Great goal: to have fun and no pre-race funk! It's still cracking me up that you did a HIM before an olympic distance tri. :) It's so exciting to be heading into a race. Hope this one goes well! Is the HIM you're talking about in October the one in Branson? I hear the hills are killer in that one. Good luck in the Oly! Looks like good target paces - it's gonna feel fast after that first HIM! That's quite a lovely run up to transition- isn't it? I like your set goal for time....sounds exactly what mine will be come July. Good luck with your first Oly. Is today race day? Go go go!